Abstract: Golf is a global sport with professional golfers playing on many organized tours throughout the world. The largest and most important tours for male professionals include the PGA Tour, European Tour, Japanese Tour and Asian Tour. The Official World Golf Ranking, or OWGR, is a system for ranking male professional golfers on a single scale. We say a ranking system is unbiased if otherwise identical golfers who happen to play on different tours have the same (or very similar) ranks. In this paper, we investigate whether the OWGR system is biased for or against any of the tours, and if so, by how much. To investigate any potential bias, we compare the OWGR system with two unbiased methods for estimating golfer skill and performance. The first is a score-based skill estimation (SBSE) method, which uses scoring data to estimate golfer skill, taking into account the relative difficulty of the course in each tournament round. The second is the Sagarin method, which uses win-lose-tie and scoring differential results for golfers playing in the same tournaments, to rank golfers. Neither the score-based skill method nor the Sagarin method use tour information in calculating player ranks, and therefore neither method is biased for or against any tour. Using data from 2002 to 2010 and comparing the results ranks from the OWGR and score-based methods, we find that PGA Tour golfers are penalized by an average of 26 to 37 OWGR ranking positions compared to non-PGA Tour golfers. Qualitatively similar results are found when comparing OWGR and Sagarin ranks. In all cases, the bias is large and statistically significant. We find a persistent bias through time and also find that the bias tends to be the largest for golfers with SBSE ranks between 40 and 120. Abstract: Who was the best putter on the PGA TOUR last year? Does taking 32 putts necessarily represent a poor putting round for a PGA TOUR pro? Current putting stats don’t provide convincing answers to these questions. 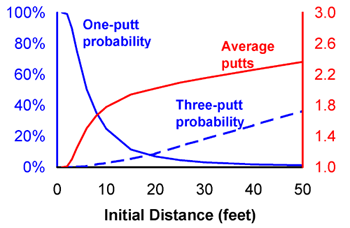 This note gives a brief introduction to putts gained, a better way to measure putting skill and rank putters on the PGA TOUR. Interfaces, 2012, Vol. 42, No. 2, pp. 146-116. Abstract: The game of golf involves many different types of shots: long tee shots (typically hit with a driver), approach shots to greens, shots from the sand, putts on the green, and others. While it is easy to determine the winner in a golf tournament by counting strokes, it is not easy to assess which factors most contributed to the victory. In this paper we apply an analysis based on strokes gained (previously termed shot value) to assess the performance of golfers in different parts of the game of golf. Strokes gained is a simple and intuitive measure of the contribution of each shot to a golfer's score. Strokes gained analysis is applied to extensive ShotLink data in order to rank PGA TOUR golfers in various skill categories and to quantify the factors that differentiate golfers on the PGA TOUR. Long game shots (those starting over 100 yards from the hole) explain about two-thirds of the variability in scores among golfers on the PGA TOUR. Tiger Woods is ranked number one in total strokes gained and he is ranked at or near the top of PGA TOUR golfers in each of the three main categories: long game, short game and putting. His dominance is a result of excelling at all phases of the game, but his long game accounts for about two-thirds of his scoring advantage relative to the field. A similar approach is used to rank PGA TOUR courses in terms of overall difficulty and difficulty in each part of the game. A preliminary analysis shows that the USGA's recent change in the groove rule for irons has had almost no impact on scores from the rough. Abstract: The software application Golfmetrics was created to capture and store golfer shot data and to quantify differences in shot patterns between players of different skill levels. Across golfers it is shown, somewhat surprisingly, that longer hitters tend to be straighter than shorter hitters. Individual golfers can be measured relative to a benchmark to assess relative accuracy and to suggest whether to focus on increasing distance or decreasing directional errors. For amateur golfers, distance errors on short game and sand shots are shown to be about three times larger than direction errors. Shot value is a quantitative measure of the quality of each shot in comparison to a scratch golfer. Shot value analysis is a useful way to measure consistency, assess a golfer's relative strengths and weaknesses, and to indicate where practice and improvement are most needed. For amateur golfers a significant contributor to high scores is inconsistency, i.e., a relatively small number of awful shots. This research also quantifies the contributions of each part of the golf game (putting, short game, sand game or long game) to overall scores for golfers of different abilities. The long game is found to be the biggest factor in the difference in scores between pros and amateurs and between low- and high-handicap amateurs. Why shots fall short: See the March 2003 issue of Golf Digest. Where should the ball be hit on this driver's clubface so that the ball travels the maximum distance? In other words, where is the club's hot spot? Which model drivers are the most forgiving? Mark Broadie, Lou Riccio, and Frank Thomas estimated statistical models using a large dataset of shots hit by a golf machine to answer these and other related questions. Their research formed the basis for the Where's Your Hot Spot? articles featured in the December 2003 and October 2001 issues of Golf Digest magazine. 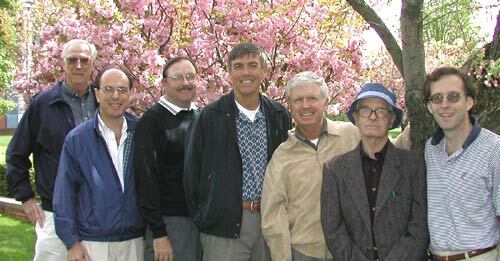 May 2003 meeting of the USGA Handicap Research Team. From left to right: Richard Stroud, Lou Riccio, Kevin O'Connor, Frank Engle, Warren Simmons, Fran Scheid, Mark Broadie.